Nitro Word to PDF Converter Not Working? Solved! Nitro Word to PDF can be the easiest ways to create PDF files from Microsoft Word documents. First, you log into your account for the Word to PDF Converter Nitro program. This can be fully done on your web browser. You then select a Word file on your computer and then choose the email that your file will be mailed to. After that, you can get your converted PDF file ready. This will come in a format that will be easy to read on any computer or mobile device. It will be better if you consider the use of an alternative to Nitro Word to PDF converter - PDFelement Pro. The Word to PDF Nitro program is rather efficient for a variety of demands. However, while using the Nitro Cloud Word to PDF converter, you will experience various challenges. In fact, it can take minutes to get some of the largest files converted properly. There's also the risk that the Convert Word to PDF Nitro program won't get everything right the first time. That is why we have put together this short troubleshooting guide with some tips on how to solve some of the common Word to PDF Nitro issues. Problem 1: Nitro PDF Creator Freezes or Crashes. Solution: If you have used Nitro Word to PDF converter for a while and it suddenly starts to crash or freeze up the screen when you attempt to create a new PDF file, you need to re-install it. Remove the Nitro program from your machine through the Control Panel. Then open the Windows Explorer and delete the Nitro folders in "appdata" and "programdata". Thereafter, you should reinstall the latest version of Nitro. Problem 2: An error message appears and says "Failed Conversion" when you attempt to print to the Nitro virtual printer. Solution: Go to the printers and devices in the Control Panel and remove Nitro PDF Creator. Then re-launch Nitro and proceed to Help -> Support -> Tools -> PDF Creation. Click the Nitro PDF Creator button to reinstall your Nitro PDF driver. Problem 3: The active hyperlinks in the Word document become inactive after conversion. Solution: This issue occurs more frequently on the older versions of Nitro. So the best solution is to upgrade your copy of Nitro to the latest version. You should also ensure that the links in the document are up to date. Problem 4: An error message from Microsoft Word says a serious problem occurred with the Nitro PDF add-in. Solution: To solve this issue, you should disable the add-in and check for an update. If an update is available, uninstall the Nitro PDF creator through the Control Panel. Then download the update and install it. Usually, this simple process will solve this problem. Problem 5: Conversion does not work after an upgrade. Solution: You need to completely uninstall the Nitro PDF converter and remove all the old registry entries that refer to the old Nitro installation. Then exit Microsoft office, restart your computer, reinstall the latest version of Nitro. Restart the computer again and then open your Microsoft Word application. With all the issues surrounding the use of Nitro for Word to PDF conversion, we recommend that you consider the use of an alternative to Nitro Word to PDF converter. You can use PDFelement ProPDFelement Pro as a Nitro Word to PDF Converter alternative that can help you with getting your PDF files converted the right way. This program works well for most computers and makes it easier for you to get all sorts of files ready as needed. Create PDF from Word, Excel, PPT, and other files. It comes with many useful PDF editing tools that allows you to edit PDF like in a Word document. You can convert PDFs into Word files and other formats with original formatting. Mark up and Comments on your PDF as easy as a breeze. Combine, split and compress PDF with original quality. Fill out PDF forms and create PDF forms easily. You can first download and install the PDFelement Pro for Windows on your computer. The installation process is very straightforward and easy to use. As you get the program ready, launch the program. You can choose to "Create PDF" in the main interface to select the Word file you want and import it to the program. And then edit the text on the PDF editor as needed. There's also the option to add pictures and other forms of media into the PDF as desired. 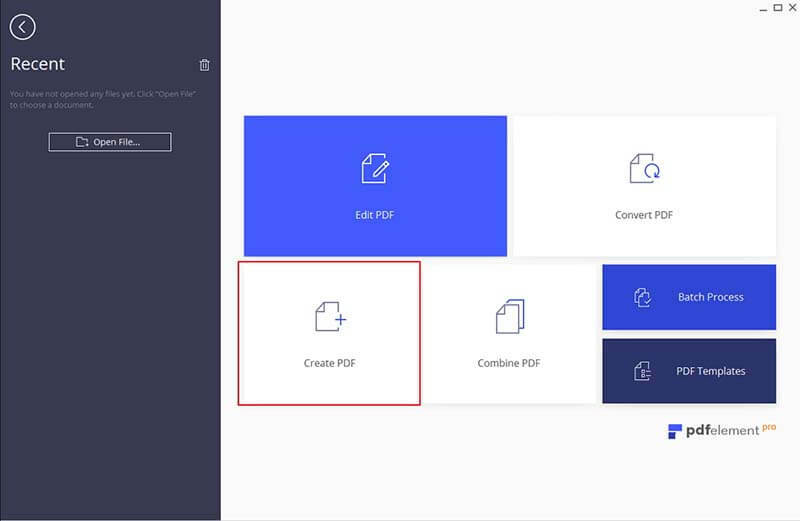 You can also combine that PDF with another PDF to create one consistent file. When everything is done, click "File" > "Save as" to save the Word to PDF. > PDF Converter > Nitro Word to PDF Converter Not Working? Fixed! Nitro PDF Converter Not Working? Fixed!